Well despite my ibook going down on me yesterday it’s been a good week. Emily, Cate and I all went to see Anne Lamott at All Saints Church on Wednesday. Her new book “Grace (Eventually)” came out. If you ever get a chance to see her in person it’s really worth it. She read a chapter from the new book based on an early article she wrote for Salon called “Let’s Have A Revolution! Does July 14th Work for You?” You can read the article on Salon, you just have to wait through some of the ads. Found this New Lovedrug Music video for “Ghost By Your Side” on youtube the other day. 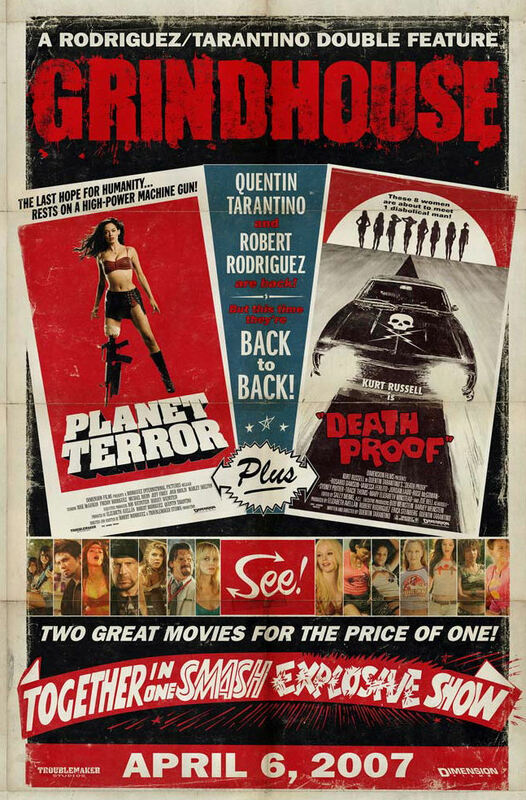 Because I am a Quentin Tarantino fan I’ve been on the lookout for his new movie Grindhouse coming out, it’s in the B-rated horror genre and I can’t wait to see it. Here’s a movie poster I found online. Burnside Writer’s Collective posted 5 ways to celebrate the 10 year anniversary of OK Computer, one of my all-time favorite albums. My favorite suggestion is #2, I would really like to go and get it on vinyl. I forgot to mention earlier, when I was chatting about Elvis that we also saw Let’s Go Sailing. I enjoyed their music and think they’d be worth checking out, the only problem is I totally forgot about them till today due to the fact that they got lost in Elvis’ wake. For those of you, who like myself, have really gotten into Twitter Maddness, here are a couple cool apps, etc. Twit This – is a way to share links via twitter. Twitterlex is an easy dashboard widget for posting to Twitter (though I normally use either a Flock plugin, 30boxes and Quicksilver to post). And Alex King has a great Twitter plugin for wordpress called TwitterTools. Did you see Grindhouse? Thoughts? I just watched Jakie Brown today. Haven’t seen it yet, but I hope to watch it really soon.